In the Montenegrin coastal town of Budva, a state-of-the-art water treatment plant is sending a clear signal for sustainability-oriented urban development and eco-friendly sewage disposal. 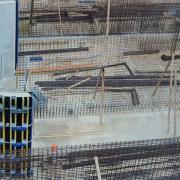 Doka supplied the formwork solution for the infrastructure of this new facility. Working with Doka Serb, the contractors completed the many different structures on schedule and the plant went onstream in the summer of 2013. The wastewater treatment plant at Budva is the first of its kind in this coastal region of Montenegro. The ecosystem and residents of this popular tourist destination beside the Mediterranean will benefit from the environmentally friendly sewage disposal that it makes possible, as will this entire stretch of coast. Plans for modernising water management in this coastal town on the Adriatic began in 2011. Some 58 m. euros have been invested to upgrade the sewerage system to EU standards. Whereas most of the soiled water used to be discharged from a pipeline many miles out at sea, the Budva region’s effluent is now dealt with 1.6 km north of the coast in the hills of Bečići. A geological survey determined that this was the ideal location for this advanced treatment facility. In the Budva treatment plant, effluent is cleaned by natural means. Various filtering techniques remove solids such as stones, sand and fibres from the water before it is biologically purified with activated sludge. Micro-organisms and bacteria cleanse the fluid of additives such as carbon or sodium. This eco-friendly process requires high-tech-infrastructure consisting of several different types of structure. This includes not only retention basins, filtration plants, aeration basins and reservoirs but also office buildings and special chemical and biological treatment facilities. Doka Serb won over the contractors with a clean, safe and dependable solution. “As early as in the very intensive planning phase, it was clear that this collaborative venture was going to be a success. And after this time, too, our flexibility and swift response to short-notice alterations had a convincing impact on Alpine Bau GmbH”, says Neboša Jovanović, Technical Manager Doka Serb. In the first phase of construction, most of the forming operations were on the walls for the plant and office buildings. These walls were formed using around 1000 m2 of the dependable Framed formwork Framax Xlife, whose logical system-grid made for fast set-up and dismantling times and great ease of handling. This high-performing large-area formwork system was also used for rapid forming of high walls and casting sections of up to 7 m in height. Around 2000 m3 of Load-bearing tower Staxo 40 was used for the up to 8 m high slabs in these buildings. In a second step, the many different tanks, of varying diameters, were formed. 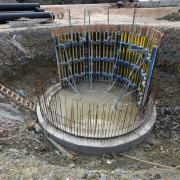 The versatile Circular formwork H20 system was used for every single one of these. This dependable formwork system can be adjusted to virtually any radius, and its flexible heavy-duty Dokaplex sheet allows continuous forming of curved surfaces down to a radius of 3.5 m. Setting the diameters is made easy by the use of screwjack mechanisms. Convenient, practical forming of a circular tank with an unusually small radius of only 2.7 m was made possible by a custom solution. On this pre-assembled custom formwork, the sheets were bent several times to enable the desired shape to be obtained. 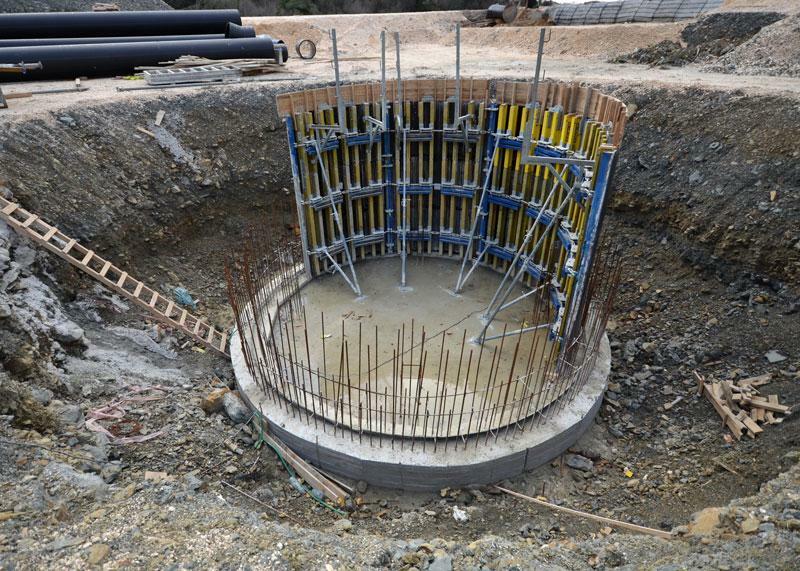 To ensure the operational and environmental safety of the treatment plant, the tanks were cast from watertight concrete. Despite this extreme requirement, the Xlife formwork sheeting delivered a superb concrete finish. 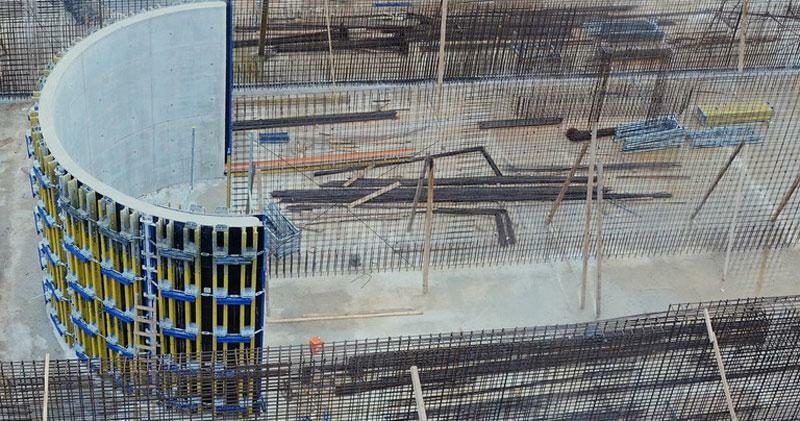 The intensive formwork planning work carried out at the start of the project gave Doka Serb some valuable advantages as early as in the bid invitation phase. The Doka Formwork Instructor who supervised formwork set-up during construction start-up, and explained how to handle the equipment correctly, also made a significant contribution towards successful and timely completion of this project. “We were very satisfied with the wide-ranging co-operation we received from Doka. The results are truly impressive, and we will definitely be continuing our co-operation with Doka systems on our next project”, says Ivan Kojović of Alpine’s subontractor firm Condor. Thank you for your interest - A clean solution for clean water. Thank you very much for your interest - A clean solution for clean water.